If you are not so keen on snakes and spiders then it might be time to look away as this mechanical snake called Titanoboa and spider transporter is enough to give anyone nightmares. The Titanoboa robot snake measures 35ft long and weighs in at one ton and once it gets covered with a realistic covering its developers say it will be able to move underwater. Check them out in the video after the jump. The creations have been built by the Mondo Crew, part of eatART of Vancouver, British Columbia, consisting of artists, designers and builders who enjoy to “make audacious and improbable large-scale kinetic, robotic, and mechanized sculptures that investigate our human relationship to energy use.”. 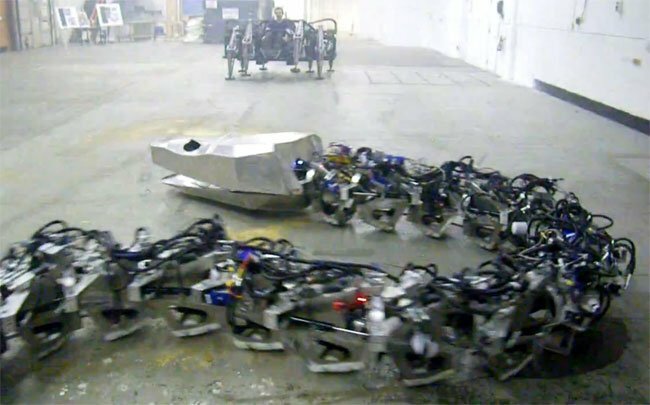 “The Titanoboa project is an exercise in alternative forms of propulsion and power applications in transport. The purpose is to showcase this experiment by harnessing and enlarging the mesmerizing movement of the snake. The huge serpent has undeniable appeal as a surreal mechanical beast that moves in a seemingly magical way over land and will glide stealthily through the water.